Garden themed pots: Swiss chard cups, cherry tomato salad bowls, plus a salt cellar and garlic keeper. Before this load could be fired, I had to solve another problem. The shelves were in serious need of care, the bottoms of the pots had been sticking - leaving behind tiny shards of fired clay. Not only is it annoying to constantly clean the kiln shelves, but it meant that a lot of my pots had bits of clay missing from the feet and it just looked bad. Fixing this means another step, but one that is worth it. I’m now coating the foot of each pot with a mixture of brushable wax and alumina. This ensures that nothing will stick to the kiln shelf and the foot of each pot will look how it should! I also scraped each shelf, and coated it with fresh kiln wash - which dried out in front of the space heater with a little help from Merlin’s studio water dish. I’m also making ornaments specifically for Market, with the Vertical Harvest logo on one side, and a ripe juicy tomato on the other. The logo is hand drawn onto the porcelain disk using an underglaze pencil. I found that I can go over the lines with a little water on a brush to make it look more painterly. It’s a few months away, but now I can’t wait until I can grow Swiss Chard and cherry tomatoes in my own garden, right outside of my studio! 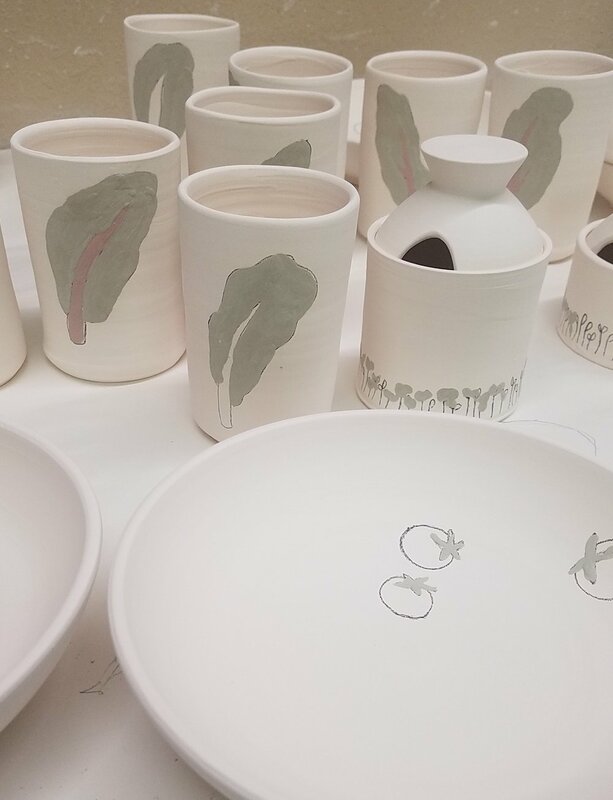 Lately these quiet snowy days have been helpful in the studio, where I’ve been working to design a new line of pottery to be sold exclusively at Market. This shop is inside Vertical Harvest, the amazing greenhouse that grows beautiful greens and tomatoes all year in Jackson, Wyoming. 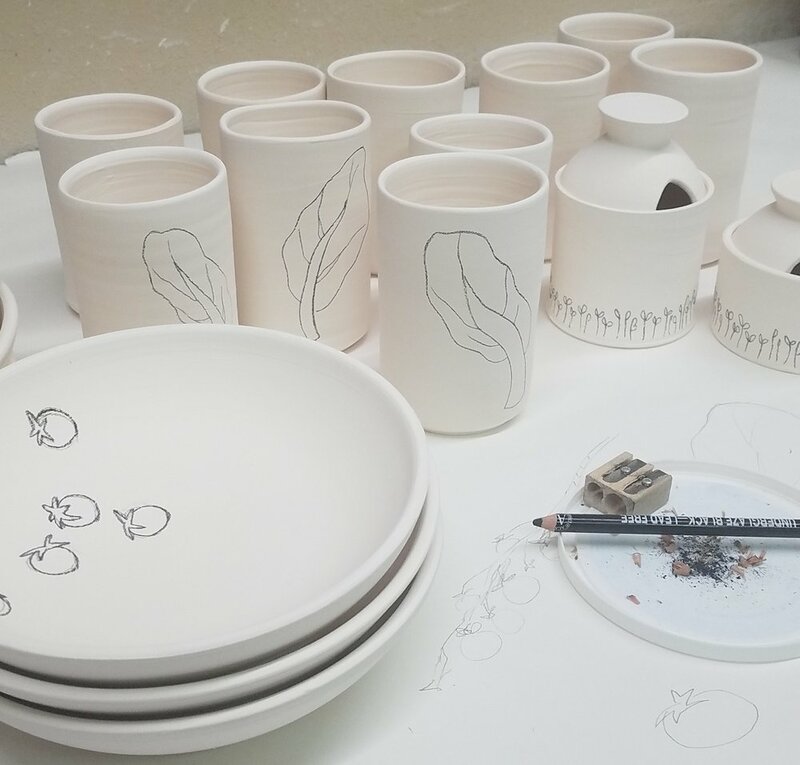 This project has taken since last spring, working through sketches, testing glazes, and mostly just thinking about how to make colorful garden themed designs - while working on all the projects that kept me busy last year. 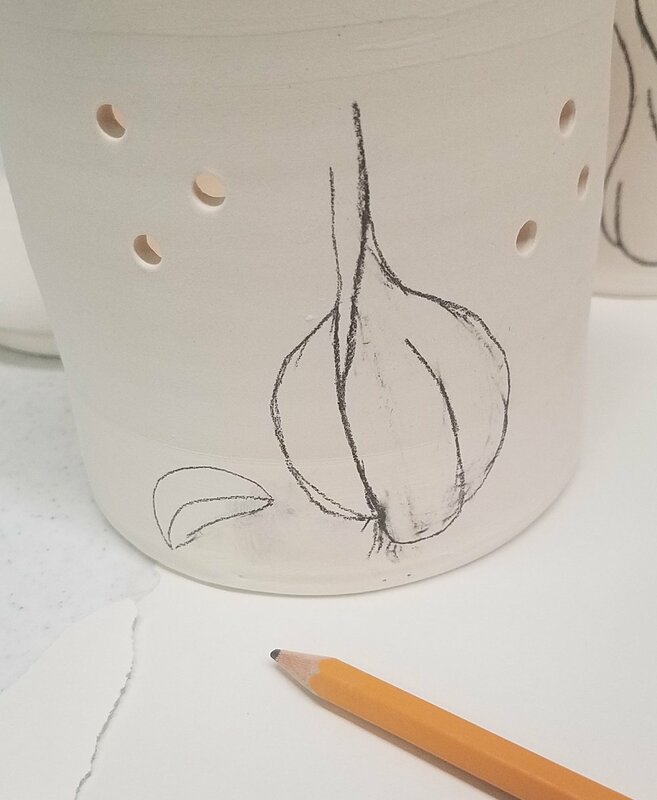 My goal was to make garden themed pots for dining: cups & pitchers, serving & salad bowls, as well as helpful items for the kitchen: garlic keepers & salt cellars. It’s been nice thinking about garden parties during this ultra-snowy winter! In January I finally made some actual pieces. New ideas don’t usually take this long, but this time the process is such a departure from my usual, and I was a little stumped. Usually I decorate the surfaces while the pots are still wet, using inlay and sgraffito techniques. But what was bugging me was that I wanted these images to have a gestural line feel, more like drawing. So I bisque fired the test pieces and ordered a few underglaze pencils. I drew Swiss Chard on the cups & pitchers, tomatoes on the bowls, micro-greens on the salt cellars, and garlic on the garlic keepers. Then started in with glaze - only using copper green and red right now; colorful, but not too colorful. Similar to the first colors of spring. The glazing is a bit tedious - starting with the greens, once the leaves are brushed on I went over them with wax resist. This way I can glaze with the second color right up next to the first color. Red goes on next, then wax over that, finally clear over everything. This is how the prototypes turned out and I’ve got a whole kiln load right now that I can’t wait to see. So stay tuned for an update! This week I delivered a batch of new pottery to Market, located inside Vertical Harvest in Jackson, WY. Just in time for fall: large soup bowls plus salt jars with little spoons.